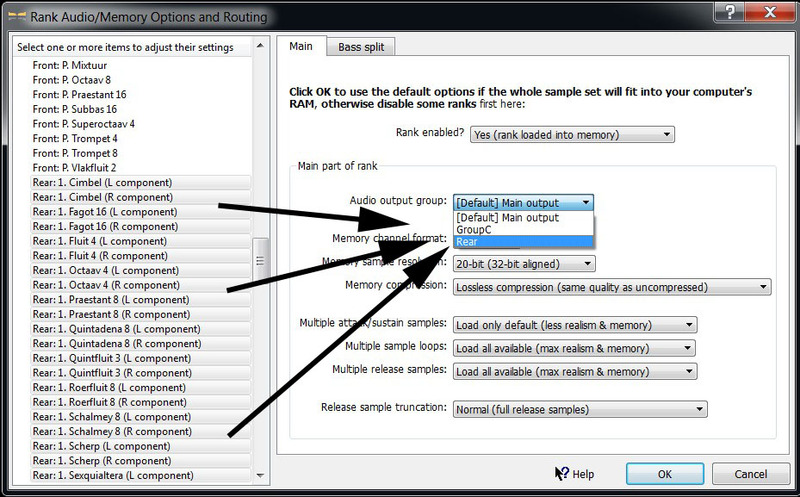 Hauptwerk advanced is necessary for the multiple channel audio output. Front channels can be routed into the front (default) speakers, while the rear channels into the rear speakers. The method to achieve this is the following: When loading the sample set for the first time, the rank rounting dialog box appears automatically. When loading it subsequently, the dialog is skipped. 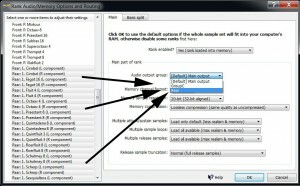 To call the dialog, load organ via the Design Tools menu, or via the option "Load organ, adjusting ranks audio output..."
To create the Rear audio output group, it is necessary to visit the General Settings, Audio output menu and Audio output group menu, and make the necessary changes there, adding new output group (you may call it "rear" or by any other name) and assigning some audio channels to this group. Please consult the Hauptwerk manual for this.